1) Tsunami waters, as by flood water, can undermine foundation resulting foundation to sink fallowed by collapse of walls and cracking in floor. So, come out of building if water surrounds it. 2) Look for help. If possible help injured or trapped persons. In appropriate case give first aid but do not move seriously injured people as it may cause deteriorating their conditions. 3) Telephone lines are frequently overwhelmed in disaster situations. They need to be clear for emergency calls to get through requiring to make calls on telephone for emergency calls only. 4) The tsunami may have damaged roads, bridges, or other places that may be unsafe to use and keep listening to weather reports, Coast Guard emergency frequency station. 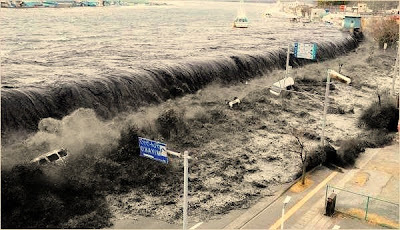 5) Flood water driven by tsunami may have damaged structures. So extreme caution have to take before entering any building. 6) To avoid fire hazard use battery powered lanterns of flash lights to examine your residence. 7) Wear safe shoes to avoid injury associated with cut feet which is common case after such disaster. 8) Look for broken or leaking gas lines, flooded electrical circuits, or submerged furnaces or electrical appliances. 9) Flammable or explosive materials may come from upstream resulting most frequent hazard and keep aware of this. 10) Open a window and leave quickly the building and turn off the gas using the outside main valve, if possible, and call Gas Company. If you smell gas or hear a blowing and hissing noise, without a professional the valve should not open. 11) Electrical equipment should be checked and dried before being returned to service. 12) Inspect electrical system damage. Any spark or broken or frayed wires or smell of burning insulation is a sign of electrical hazard. The main fuse box or circuit breaker should be turned off at once. But, if, to reach their, you have to step in water call an electrician first for advice. 13) Tsunami flood waters flush snakes and animals out of their homes and may have come into buildings with the water. Use a stick to search in debris. 14) Take pictures of the damage, both of the buildings and its contents, for insurance claims. 15) Clear mud with shovel from walls and floors to dry up them. 16) Any food that became in contact with flood waters may be contaminated and should be thrown out. 17) If sewage and water line have damaged, avoid using the toilets and call a plumber. 19) Safe water can be derived from undamaged water heater or by melting ice cubes. Use tap water if local health officials advise it is safe. 20) Examines walls, floors, doors, staircases and windows to become sure that the structure is not in danger of collapsing. 21) Inspect foundations for cracks or other damages to avoid possible collapsing hazard.